Nobody can deny the entrepreneurial and technical abilities of Gianfranco Rizzardi, one of the men who, in the most recent history of national pleasure sailing boating, has managed to make his name as a benchmark. He, , who in just a short while, has been able to lift a titled boatyard like Posillipo out of its troubled past, managing to impose his range of fly motoryachts practically all over the world. 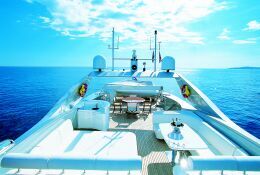 Such skillsSkills tha find their maximum expression in the boatyard's new flagship, the Technema 105, one of the most popular motor superyachts made in Italy right from its debut at the latest edition of the Festival de la Plaisance in Cannes. 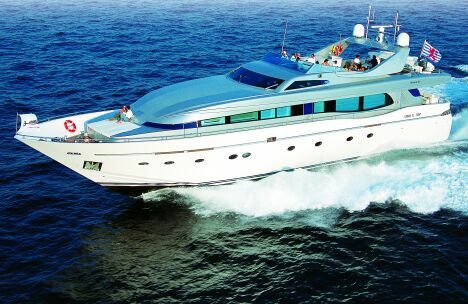 "It only took us 700 days", Rizzardi told us precisely on that occasion, "to produce this boat, from project to launch". In our opinion this aspect on its own is a tangible expression of the skill and the determination of this manager who, after having identified his target, that of realising a boat of absolute value, manages to achieve it in the shortest time possible and according to the preset standards. In effect, the boat is a maxi of great calibredepth, rich in personality without excesses or forced style, whose design was entrusted to an architects architect who, precisely in the sector of large boats, is proving to be one of the most gifted and prolific, the Tuscan Francesco Paszkowski. 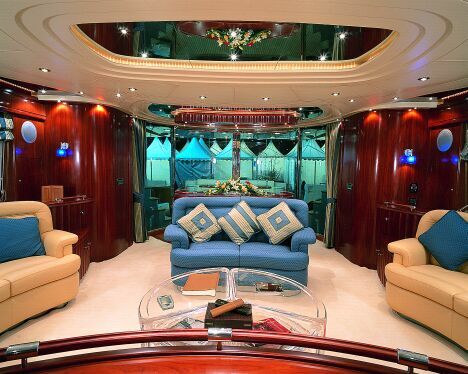 The boat owes its extremely balanced layout to him: in it, , where thanks also to the use of plenty of glass surfaces running practically all along the main deck, the large volumes of the boat hull itself do not weigh down its linesline . Bottom and engineering of the Technema 105 were, on the other hand, directly elaborated by the boatyard's technical office, backed byrelying on a their consolidated know-how, enriched by avant-garde project techniques. 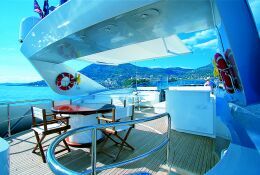 On board this majestic Posillipo, everything is on a large scale and comfortable, right down to the finest detail, offering maximum well- being and enhanced by exceptionally rich fittings, as befits a top class boat. None of the areas on board gives a different sensation. 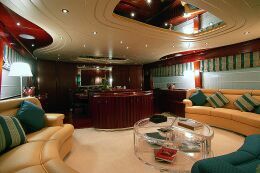 The saloon, separated from the cockpit by a large glass semi-circular door that can be fully opened, is so vast that it manages to include a furnished living area with three comfortable sofas that still leaves plenty of room. This area is separated from the dining area, located in the bow, by an ideally positioned wooden service unit from which, thanks to a servomechanism, a large plasma television set emerges. Still on the main deck there is the owner's cabin, making the most of the full beam of the bridgehousedeck-house, with en suite bathroom, complete with Jacuzzi and a separate dressing room. 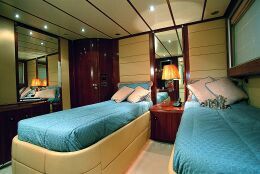 The guest cabins, four in number, While no less than four guest cabins are situated on the lower deck, each one with its own bathroom. 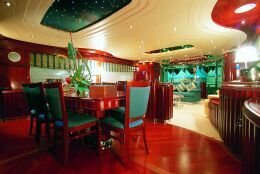 Continuing on the lower deck there is also the galley, not only beautiful to look at but also extremely functional, thanks to its capillary layout. 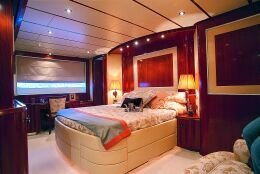 From here, towards the bow, there is direct access to the crew's quarters, with a total of three cabins, each one with its own toilet. Externally too, the Technema 105 presents carefully thought out solutions on both aesthetic and functional levels. A good example of this is how the flying bridge has been developed with its sundeck, living area, comfortable seating, corner bar cocktail cabinet and the external skipper's station perfectly integrated with each other in a wonderfully comfortable layout. C.N. Rizzardi - Loc. Porto del Bufalo - 04016 Sabaudia (LT) - Tel +39 0773 517135/6 - Fax +39 0773 517139 - E-mail info@rizzardi.com.